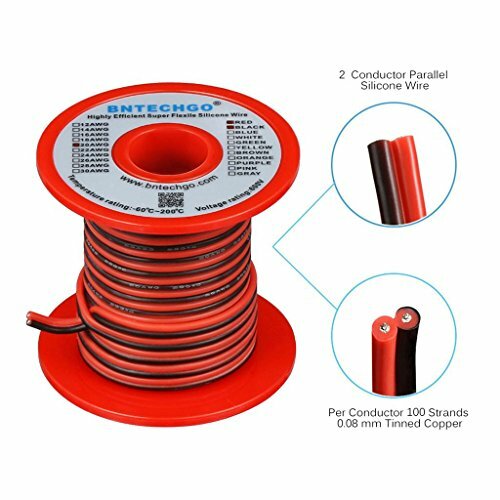 BNTECHGO 20 AWG red black 2 conductor parallel silicone wire,ultra flexible soft,easily separated,easily to use. Long life: 20 Gauge 2 conductor parallel silicone wire Core made with 100 strands 0.08 mm tinned copper wire per conductor,tinned copper wire has a better anti-oxidation performance,feature high conductivity,lower resistance,reduce the producing of heat,and anti-aging. Silicone rubber insulation which make it more durable and eco-friendly.High temperature resistance 200 degree C,low temperature resistance,in extreme cold -60 degree C.Rated Voltage:600 volts. Widely used:for single color LED strip lights,various DC electrical hookups including model planes,model cars,model ships,batteries,lamps,household appliances,electric heating appliances,meters,instruments,motor lead wire and digital fields. Also available 14 gauge,16 gauge,18 gauge,22 gauge ultra Flexible 2 conductor parallel silicone wire. Long life: 20 Gauge 2 conductor parallel silicone wire Core made with 100 strands 0.08 mm tinned copper wire per conductor,tinned copper wire has a better anti-oxidation performance,features high conductivity,lower resistance,reduce the producing of heat,and anti-aging. Package Included : 25 feet 20 gauge red black 2 conductor parallel silicone wire.Also available 14 gauge,16 gauge,18 gauge,22 gauge ultra Flexible 2 conductor parallel silicone wire. If you have any questions about this product by BNTECHGO, contact us by completing and submitting the form below. If you are looking for a specif part number, please include it with your message.